The good place to put all the leftover pasta. So what’s great about pasta pies? The texture: it’s unbelievably crispy on the top, bottom, and sides (but wonderfully soft and juicy in the middle). It’s like the top layer of the lasagna, but amplified. It’s so adaptable. Turn any of your favorite pasta combinations into a pie, whether from leftover form or from scratch. You can make it ahead. Form the pasta pie and hold it in the fridge (or for a shorter time at room temp), then finish in the oven when guests arrive. You can present the whole pie to diners and they can slice however big of a piece they want. The leftovers are really good. Even if you made it from leftovers, the leftovers are good. And as someone who hates eating the same thing over and over all week, that’s a major plus. Undercook the pasta. Remember that the oven will continue to cook the pasta, so just like with ziti or lasagna, undercook your noodles by a few minutes—enough that they are flexible, but still have bite. 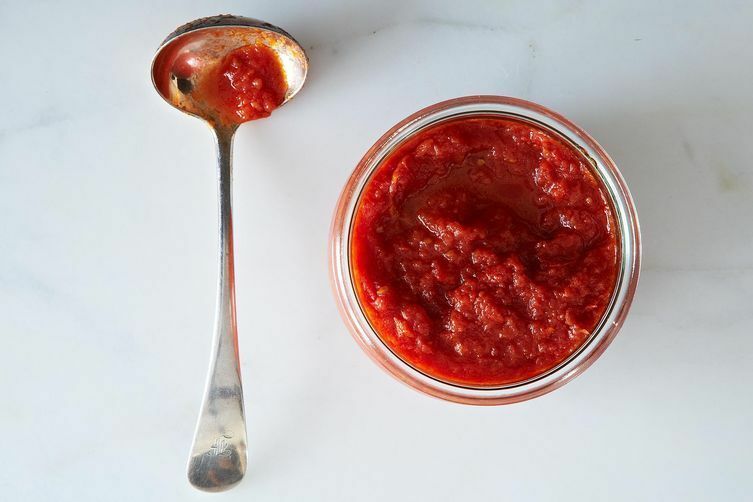 Make it saucy (…er). A similar note: The oven will dehydrate things a bit, so a little extra sauce (or a slightly thinner sauce than usual) doesn’t hurt. Remember that inclusions can affect the way things slice—so make things bite size or in a similar shape/size to the pasta. Let pasta shape determine pie shape. Long pasta, like spaghetti or bucatini, can be wound into rounds like a spiral, while shorter pastas can be arranged facing top to bottom. Both look pretty awesome, both whole and when sliced! Because you can never go wrong with Marcella’s anything: a simple pasta pie with Marcella’s tomato sauce is maybe my favorite pasta pie of all. Throw in fresh mozzarella and top with plenty of basil and everyone will swoon. Consequently, this is my actual favorite, so recipe, including shaping, is below. And speaking of Genius Recipes, this combo is amazing, and makes a mean pie, too. Try this recipe with ziti or penne, stack them in a cake pan, and watch the crowds swarm. A classic pasta that makes a beautiful pie. Add plenty of cheese on top. How do you use up your pasta leftovers? Tell us in the comments below! My mom made frittata di pasta every Sunday in the summer. We took it to the beach instead of sandwiches. leftover cooked pasta, eggs, park cheese, fresh parsley, mixed and them fried in a deep fringe pan, flipped and fried again, then cool and cut into wedges. Bucatini is a must! I make it with buttered pasta and fresh herbs. Perfect summer fare, cook in the morning, serve in the evening! I remember seeing pasta frittata for the first time on the Frugal Gourmet, the first cooking show I loved when I was a kid. It was one of the first recipes I made by myself. I just made something related this week, using chickpeas and Spanish seasoning and binding with eggs. My reference for something similar is Greek pastitsio. 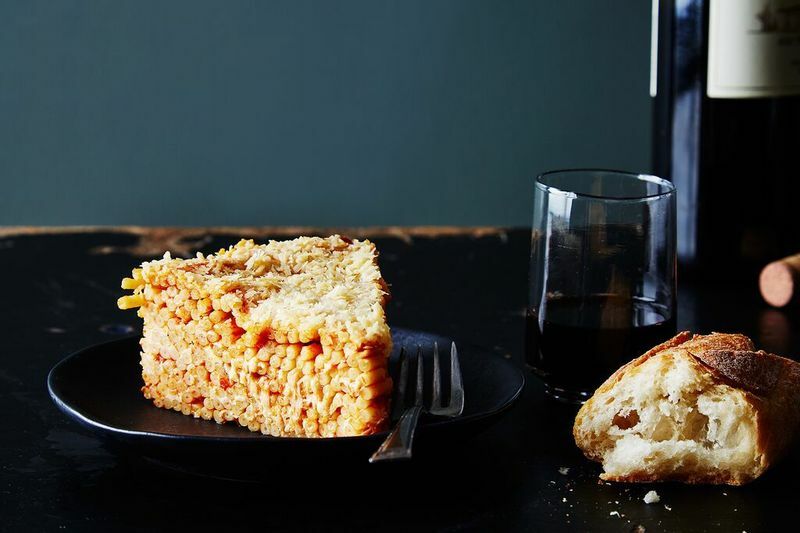 It's a specific recipe -- with minced lamb and a collection of spices where cinnamon takes center stage -- not necessarily meant to use up leftover cooked pasta. But I like the idea of extending the pasta casserole idea in the way suggested here. Like many of the other commenters, I am not convinced it's worth doing this sort of dish "strand by strand." Layering it in a rectangular heat-resistant oven dish will continue to be my choice. My mom has been making this for just about as long as I can remember. (and I'm 58) We'd always have it the next day or a couple of days later and it was always amazing. She would just take the pasta, put it in a frying pan and cook it on low until it was....well...a pie......Deelish. YES--catalinacruz, "strand by strand" my foot! I started laughing uncontrollably! I guess strand by strand would look great, but I really have better things to do with my time. 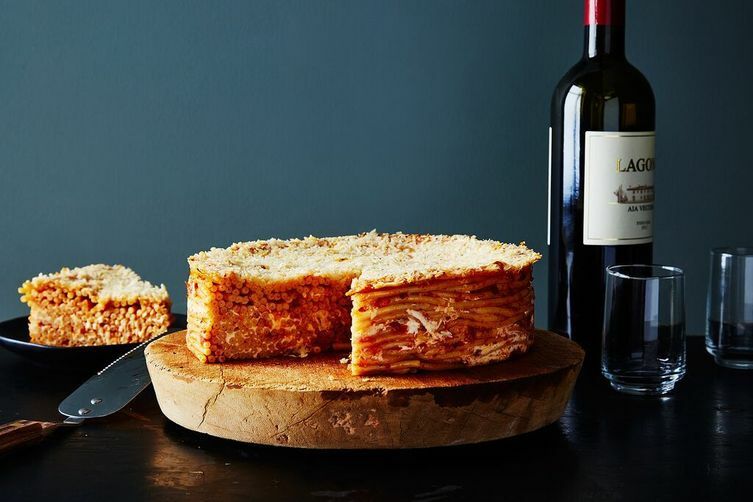 I could imagine using lasagna noodles, piece by piece, on their sides and in the pan like a giant roll-up. Cheese and such on every piece as you roll, maybe on top of a lasagna-cut-to shape bottom "crust". But spaghetti strand by strand--talk about micro-managing your pasta! Exactly what I thought. I can just see me winding pasta about the bottom of a springform pan and dipping every other into the gravy and cheese AND eating each delectable strand, whoops, no pie.! Oh my goodness! I want to visit each of you! Your suggestions and creations sound even better than the recipe! I love a great "baked spaghetti" but I don't think I'll be arranging it strand by strand. "Strand by strand" !?!? 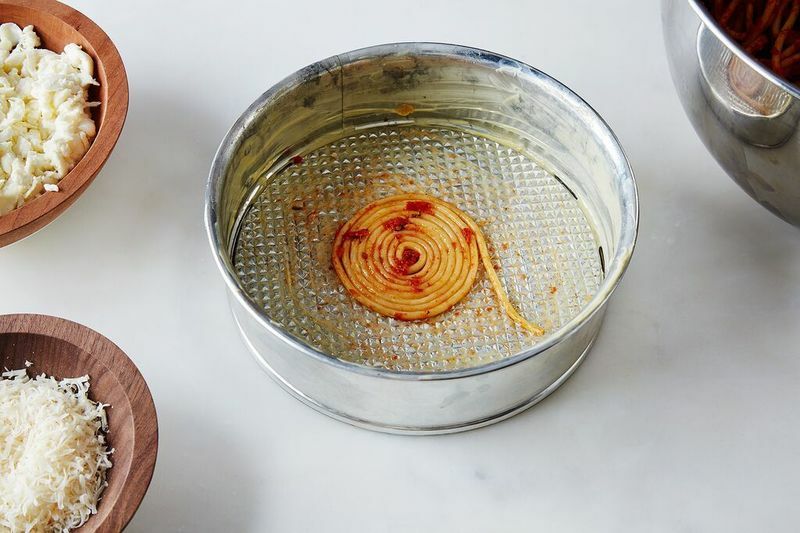 How about dumping in the pasta, layer by layer, for those of us who are not into the zen of spiral-strand forming. It will not be as artistic (or time consuming), but will taste just as good. The recipe looks delicious. My grandmother always made a baked spaghetti that took all day to cook. To this day, it is one of my favorite meals. We have a garden with several basil plants that have gone out of control. Since I won't be buying basil, how much chopped basil is in a "half bunch"? Thanks! Leftover pasta is excellent in a frittata. I usually saute the pasta with a little olive oil and garlic, then add cooked veggies (if using). Seasonings can vary, of course, but basil, Parmesan, and pepper flakes brighten it up for me. Making sure there's enough oil, I add my beaten eggs and cook it. I sometimes slide it onto a plate and turn it back onto the pan, but I often top it will mozzarella and stick it under the broiler until lightly browned. Top with tomato sauce if desired! this is a common famiglia favorite in my household, ours is a version called "il timpano" which includes pasta, meats, sauce and cheeses all layered and wrapped in a thin outer dough/crust, baked and served as a savory pie. this recipe was made famous here in the US when featured in the movie "Big Night". Your version is wonderful, as mine is a laborious process, this could easily be made for a weeknight meal, etc. My Italian family reheats leftover pasta and sauce in a frying pan. We melt butter in the pan, add the leftover pasta and sauce and fry until crispy. Stir while heating so that every piece gets coated. Delicious! Almost better then freshly cooked pasta. In Brazil, we call this "macarronada". What is it that holds the pie together? I'm wondering because I want to make a butternut squash sage version but without adding too much (or any cheese). Do you think that would hold together just from the drying out process? I think the cheese holds the pie together in this recipe. I add beaten eggs in the recipe I use (4 beaten eggs per 500g pasta). Thanks, Gianfranco! I made a version of this last night with butternut squash sage sauce, brown rice pasta, a little parmesan, and added 3 eggs per your recommendation. It was DELICIOUS and held pretty darn well, though I think one more egg would have been even better. Margo - I do think this would freeze well in pieces. Not sure about whole. Is this a typical Italian dish? Love your take on this recipe! Have to ask tho, do you assemble it strand by strand as it says the recipe? My grandmother always made pizza chena around Easter time. Don't let the name fool you, it's nothing like the image that first comes to mind. It's basically a pasta pie. Ricotta is mixed with eggs, grated parmesan, mozzarella in it's most basic form. Chopped meats such as mortadella, salami, sausage, etc. are added. Other chunky cheeses can go in. This cheese mixture then has pasta, usually penne or ziti mixed in. The whole mess is then added to a pie crust. You can either leave the top open (my favorite) or cover with another piece of pie crust. But leave it open and top it with more cheese and let it get browned up and crunchy. This is a kitchen sink kind of recipe. Anything can go into. I've taken leftover pasta in cream sauces, some leftover chicken, added some leftover broccoli and whatever else the tupperware gods were willing to give me out of my refrigerator and have coaxed out some classics. Don't want to deal with a pie crust? No problem, just grease up a springform pan. But leftover pasta (or freshly cooked for that matter) is the key. It is fun but sometimes challenging to use leftovers. I like your ideas since like vodka, everything is good with pasta! I can also recommend the Maltese version of pasta pie. 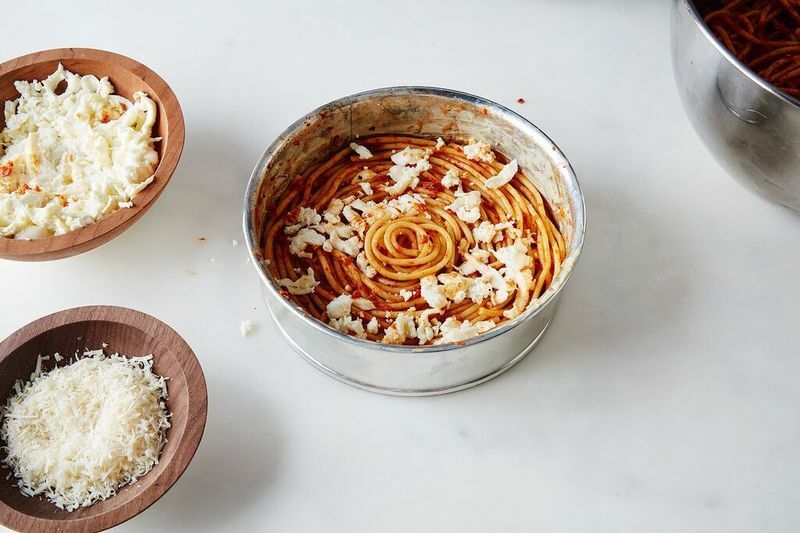 The basic one is called "Mqarrun il-forn" or "Ghagin il-forn" (translates to "pasta in the oven" such as this http://www.jamieoliver.com/recipes/member-recipes/recipe-detail/272/#4RztDr4CjJZ96gRx.97) or "Timpana", which is basically the same recipe, but encased in a shortcrust or puff pastry (https://www.pinterest.com/pin/419890365234372721/). They are often eaten as snacks, but also served for lunch or as a first course for big celebrations (eg Christmas day).